Deputy Labour leader is giving a speech today with plans on how party would rebalance 'distorted' digital market. 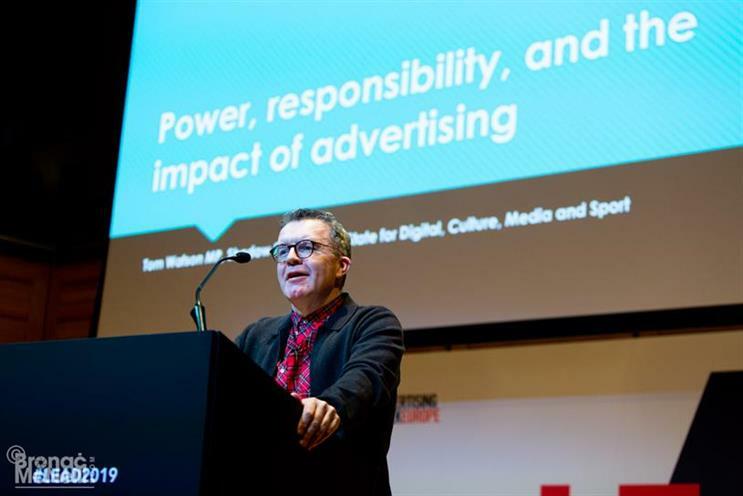 Labour’s deputy leader, Tom Watson, is to call for "radical action" to fix the "distorted" digital market, including greater transparency around political ads, in a speech today in London. The shadow secretary of state for digital, culture, media and sport is expected to lay out proposals on how Labour would "rebalance" a market where the concentration of power among a few companies such as Google and Facebook is causing "serious social harm and subverting democracy". This will include ensuring that any online political advertisers that are targeting Britons must be based in the UK. Watson will also call for more transparency in political ads so that people understand which organisation has placed an ad and which demographic it is targeting. In the speech, Watson will say: "Tech companies will need to confirm that all online political advertisers targeting UK citizens are physically located in our country. We have the right to know who is trying to influence our views and how they are trying to do it. Agents of disinformation amplify their lies through targeted digital adverts and social media bots. So all automated accounts on digital platforms should be clearly labelled. "And political advertising should be more transparent, so consumers are confident they know who placed the advert they are seeing and understand the broad demographic criteria by which they were targeted. Too many platforms choose ad sales over accuracy, clickbait over credibility." He is also expected to hit out further at tech companies by saying that these businesses are making billions by monetising the data they have on individuals. "Yes, they offer us a service in return, but only worth a fraction of the fortune they gain," he will say. "This is surveillance capitalism. The power dynamic between platforms and users has long been lopsided." Creating a statutory regulator that would have the power to "prevent market abuse and break up monopolies". Introduce laws to give more power and protection to consumers in the form of a digital bill of rights and a legal duty of care. Establish rules that "protect our democracy from subversion" online by introducing "digital democracy guarantees". He will be speaking at the Whitechapel Gallery at an event hosted by think tank Progressive Centre UK, with a speech entitled: "What can be done to harness the power of digital to enhance not endanger our democracy?" Earlier this week, the IPA made an urgent call for a public register that logs all political ads that appear on online platforms such as Facebook, Google and Twitter. This would also be funded by the sites that host the ads. It is not the first time that Watson has delivered a strongly worded speech on the changes needed in advertising. Last week, at the annual Advertising Association conference Lead, he told the industry to ban characters on cereal packets or Labour would.